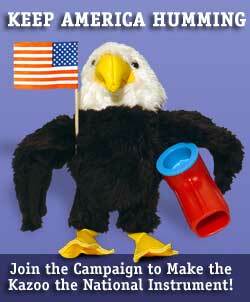 Join the Campaign to Make the Kazoo the national instrument! Download this letter by Right-Clicking and selecting "Save Target As", thus saving the file to your computer. Then fill in the blanks and send to your elected officials. Or, print this page to send to your elected officials. Click here to hear our campaign theme. 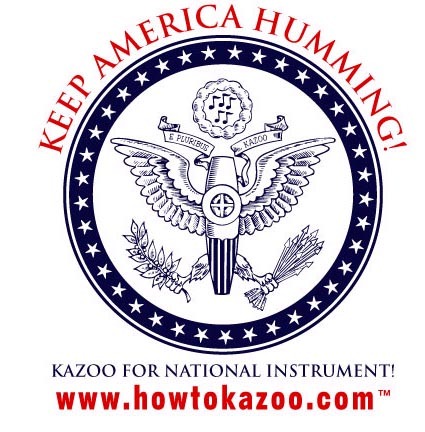 Please join Barbara Stewart and Kazoophony in the Campaign to Make the Kazoo the National Instrument to Keep America Humming! We already have a national song, a national bird, and a national debt. We may not need those either, but why not make the kazoo the national instrument? This is the one non-partisan issue on which both red and blue states can agree, since it truly matters to no one. The kazoo is clearly the ultimate democratic instrument. While only a small elite can play the sousaphone, any constituent of yours who can talk, sing, or hum can kazoo. This uniquely American instrument was invented in Macon, GA in the 1840’s by an American black named Alabama Vest and made to his specifications by a German-American clockmaker named Thaddeus Von Clegg, according to jazz legend. It is a real instrument not a toy, and there is still one major manufacturer in the United States (Kazoobie Company) which has at least 3 or more employees. Widely associated with the 4th of July, New Year’s, and other American celebrations, never has the Star Spangled Banner sounded so daunting as when performed on kazoos. Nothing else quite captures the individual character and “do it yourself” spirit like the kazoo. Even though kazooists have been victimized by high oil prices that raised the cost of plastic kazoos by 70%, the bands play on. We ask you to step forward and stand up in the sitting Congress to raise your voice in support of the kazoo as national instrument. Thank you for your attention to this important matter. I would appreciate a prompt response from you.